Why? 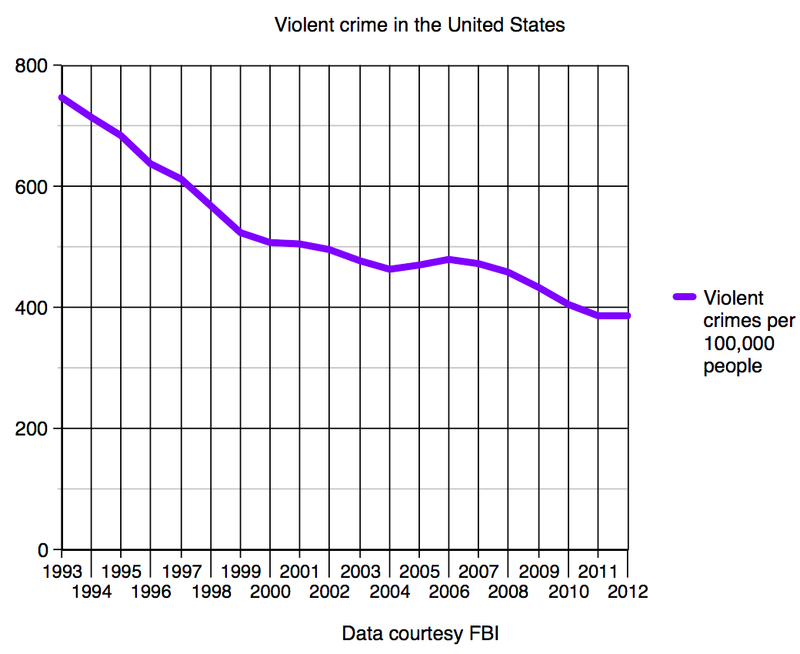 Because the data is clear: when wine consumption goes up, violent crime goes down. And vice versa. Take a look at the charts below, from U.S. data over 20 years. Appearances do not deceive. The Pearson correlation coefficient (R) for these two data sets is -0.9139; the maximum possible for negative correlation is -1.0. In other words, these two items are very strongly anticorrelated. And not just in the U.S. I ran the same study for France, which was more difficult because I had a harder time getting good numbers. 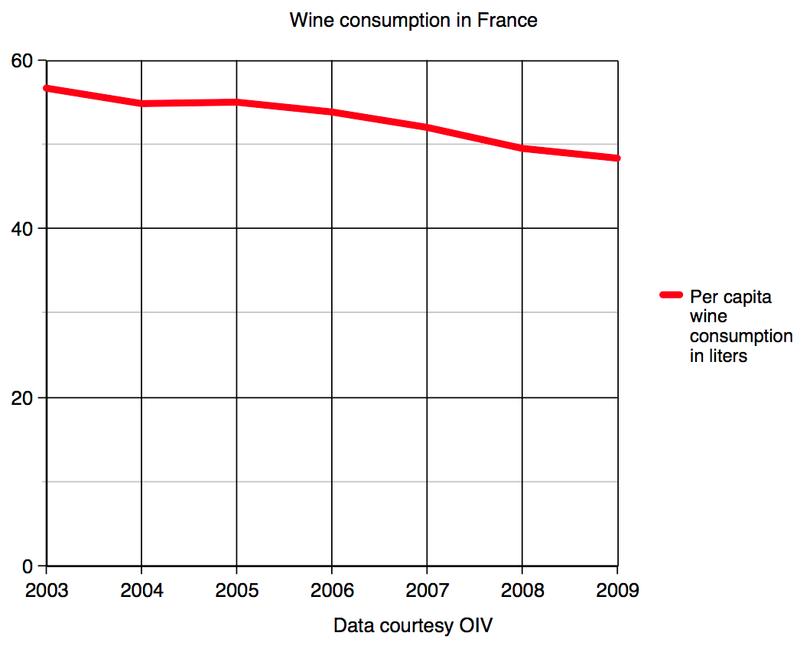 The negative correlation between violent crime and wine consumption is even stronger in France, with R = -0.9599. 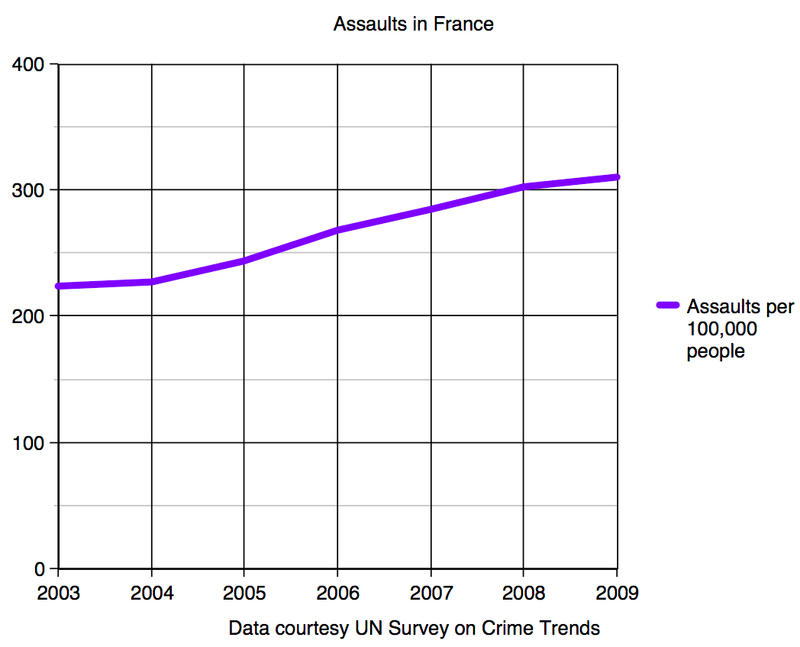 The upshot is, if we want to reduce violent crime, we need to urge more people to drink more wine. Correlation, of course, does not imply causation. We don’t know why more wine consumption per capita correlates with less violent crime. Perhaps there is some factor that affects both, although the ones we might instinctively reach to — greater economic equality, a stronger middle class — don’t seem to apply. 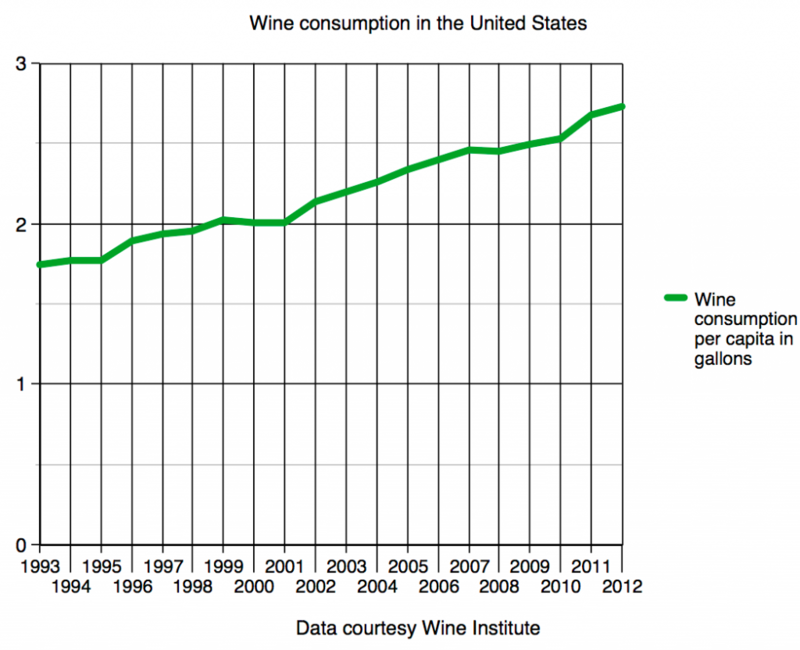 But the correlation is intuitively correct for wine drinkers. When was the last time somebody got belligerent with a bottle of Barolo? Unfortunately, it’s not so obvious to politicians, who in many places continue to regulate wine like a dangerous substance instead of the life-saving beverage it actually is. It’s also not obvious to the mainstream media, which at best treats wine as something naughty, like a getaway weekend to Las Vegas, with the implication that while you might have fun, you might end up afterward missing a tooth, your wallet and your memory. This is why I created these charts: because of a report on NBC’s Today Show that I didn’t see. To be fair to the Today Show, it frequently does segments on wine that are apparently positive. I don’t watch it, so I can’t say. I was staying with a friend in New Jersey, whom I introduced to wine a few years ago. At that time, he was married, not coincidentally, dare I say it, to an Italian-American Catholic; not a wine drinker herself, but not someone to criticize its existence. When they were together my friend and I would go to his local wine shop and I would pick him out a mixed case. Now he’s divorced and living with one of the 1/3 of American adults who say they do not drink alcohol at all, ever. Anyway, I was sitting at their kitchen table eating breakfast when she came down to tell me about the interesting news she had just learned on NBC. First, there’s wine for women now! I responded with the statistic that women buy more than 50% of the wine sold in America; they just brag less about it. Apparently the Today Show showed one of the slickly marketed brands of purchased bulk grapes packaged to appeal to the Sisterhood. At first I thought this must be because the wine brand paid somebody. But when I heard what came next, I was not so sure. My friend’s partner told me that wine drinking is becoming a real problem for women. That women are drinking wine on play dates for their kids. What about the children?! Oh God, it’s the lowest common denominator of political opposition. I sighed. “If I had to sit and watch a bunch of 6-year-olds on a play date, I’d want a glass of wine,” I said. She persisted. Women are binge drinking and becoming alcoholics. She said NBC reported that binge drinking is defined as four or more glasses of wine. And this had to be accurate because Maria Shriver said so. I had been out with my friend and his partner the previous night to a BYOB sushi place, where I consumed most of a bottle of 1998 Vina Tondonia blanc; what the hell, there was no corkage fee. She had been shocked that I was willing to spend $35 on a bottle of wine, and now I realize she was also shocked by how much of it I drank. Dear readers: When was the last time you went “binge drinking” by this definition? I’ll tell you what, if I open a nice bottle of Mosel Riesling or Santa Rita Hills Pinot Noir, I’m going on a binge. I didn’t tell her this, because if I had, well, that defines me as having a drinking problem, doesn’t it? These people are out there — they’re 39% of the U.S. population. And not just here. Former French president Nicolas Sarkozy is a teetotaler and he did the most damage to the French wine industry of any politician in its history, including Marshal Philippe Pétain of the Vichy regime. You want to blame somebody for France’s rise in violent crime? Look at the charts. We can’t sit idly by and let Maria Shriver or whatever bobblehead is on TV characterize wine as dangerous. (What about the children?) We have to fight back. No matter how much data is published on wine’s health benefits — and there has been plenty — anti-wine people still make irrational arguments against it. Against us. We can’t win by defending wine as pleasure and beauty for its own sake. The values we hold dear aren’t universal. But we can make this powerful argument, thanks to the charts above. The next time somebody tells you wine is bad, direct them to this article. The numbers don’t lie. You want to reduce violent crime? Get more people to drink more wine. This reminds me of the Church of the Flying Spaghetti Monster graph showing how the decline of pirates has led to an increase in global warming. The numbers don’t lie. You want to reduce global warming? Get more people to become pirates. This is the same graph used by gun-rights activist to prove gun ownership and concealed carry laws reduce violent crime. However, I suspect that when gun-right activist resort to the graph to prove their point, they are far more likely to be on target (no pun intended) than are wine bibbing activist. With the author of this opinion being a proud member-in-good-standing of both groups. Tim: Actually, looking at your graph, the key to fighting global warming would be to reduce piracy, right? I don’t have a hard time imagining a correlation between global warming and the total number of pirates. Both are a function of overall rapid population growth. If you use total numbers, you can find a correlation between global warming and almost anything. You’ll note the difference in the charts above is that I’m talking about rates, not total numbers. I’m with Sediment Blog. But I’m not sure I need to fight over it if it’s a magnum.